One step closer to a championship, as Manchester City beat Everton 3-2 to take advantage of another match in hand they had to complete, which puts them at the moment on top of the Premier League, coming back from an early Everton goal thanks to an equalizer from Sergio Aguero and a brace from Edin Dzeko, who finished the match with one of the most embarrassing pieces of acting we’ve seen this season. But what’s a tarnished reputation when there’s a championship on the line? Lee Probert allowed Dzeko to sleep on the ground for four minutes before forcing him up through the medical crew and be taken off the pitch. His six minutes of added time weren’t enough, but Everton’s momentum was killed off by Dzeko’s antics, and they barely managed a chance in the final 10 minutes of the match. Ross Barkley scored a beautiful one touch shot from outside the box in the 11th minute, but Manchester City took control of the match from that moment, taking advantage of some terrible defending on Everton’s behalf. First it was Sergio Aguero easily finding his way in the box, taking advantage of Phil Jagielka making the wrong decision and a poor reaction of Tim Howard at goal. The second goal came just before the half, as a combination of awful defending from Antolín Alcaraz and a super slow motion reaction from Howard made Dzeko look like a genius with his header. 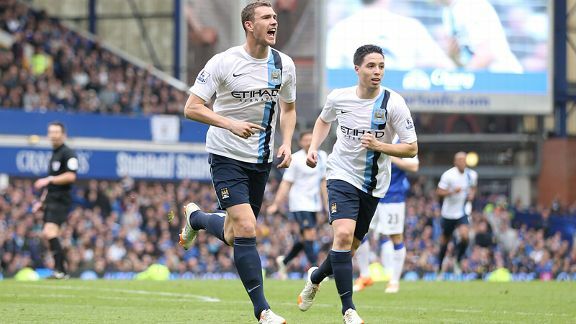 Manchester City continued to press in the second half, scoring through another poor defensive showing by the Everton defense, as Edin Dzeko was left completely alone in front of Howard from three meters, pretty much securing the win. Everton scored in the 65th minute with Romelu Lukaku connecting with a cross from the left wing to give themselves some hope of helping their neighbors and making it to the Champions League. But despite some creative efforts from Ross Barkley and Gerard Deulofeu, Everton didn’t have enough in them to break through the Manchester City defense. Dzeko’s time wasting and Joe Hart being in the right place at the right time kept the win with the visitors, who are now one step closer to winning a second championship in three years.